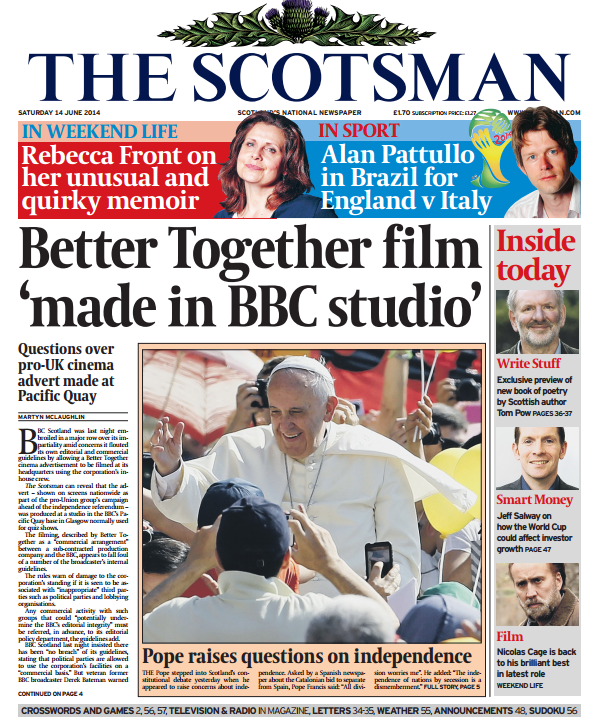 Better Together film ‘made in BBC studios’ from The Scotsman – The independence referendum drew focus on the BBC’s impartiality and journalistic standards like never before. In a series of stories I wrote about how a cinema advertisement for the Better Together group was filmed at the corporation’s Scottish headquarters, and of the controversy surrounding a shadow cabinet secretary being paid to present an independence-related discussion show (the MSP later backed out of the project after my articles). BBC Scotland was last night embroiled in a major row over its impartiality amid concerns it flouted its own editorial and commercial guidelines by allowing a Better Together cinema advertisement to be filmed at its headquarters using the corporation’s in-house crew. The Scotsman can reveal that the advert – shown on screens nationwide as part of the pro-Union group’s campaign ahead of the independence referendum – was produced at a studio in the BBC’s Pacific Quay base in Glasgow normally used for quiz shows. The filming, described by Better Together as a “commercial arrangement” between a sub-contracted production company and the BBC, appears to fall foul of a number of the broadcaster’s internal guidelines. The rules warn of damage to the corporation’s standing if it is seen to be associated with “inappropriate” third parties such as political parties and lobbying organisations. Any commercial activity with such groups that could “potentially undermine the BBC’s editorial integrity” must be referred, in advance, to its editorial policy department, the guidelines add. The Scotsman has learned that Rob Shorthouse, director of communications at Better Together, was among those present in the BBC Scotland studio when the minute-long advertisement was being made. It was filmed at the beginning of April in Pacific Quay’s studio B, used to film popular BBC network programmes such as The Weakest Link and Eggheads. 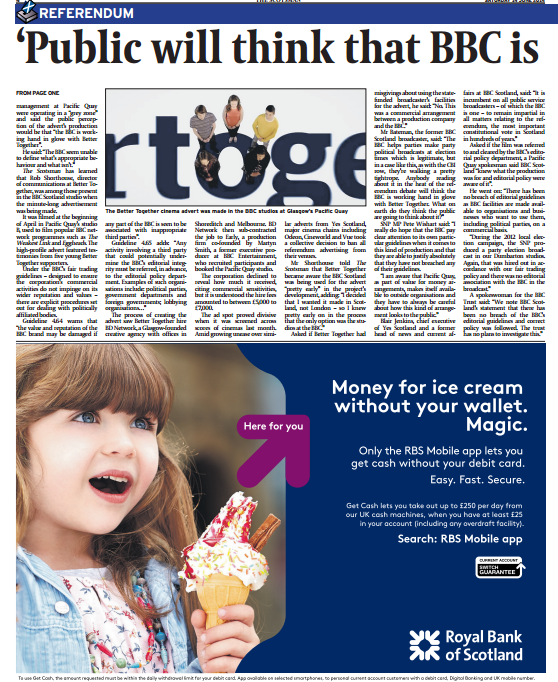 The high-profile advert featured testimonies from five young Better Together supporters. Under the BBC’s fair trading guidelines – designed to ensure the corporation’s commercial activities do not impinge on its wider reputation and values – there are explicit procedures set out for dealing with politically affiliated bodies. Guideline 4.64 warns that “the value and reputation of the BBC brand may be damaged if any part of the BBC is seen to be associated with inappropriate third parties”. The process of creating the advert saw Better Together hire BD Network, a Glasgow-founded creative agency with offices in Shoreditch and Melbourne. BD Network then sub-contracted the job to Early, a production firm co-founded by Martyn Smith, a former executive producer at BBC Entertainment, who recruited participants and booked the Pacific Quay studio. The corporation declined to reveal how much it received, citing commercial sensitivities, but it is understood the hire fees amounted to between £5,000 to £7,000. The ad spot proved divisive when it was screened across scores of cinemas last month. Amid growing unease over similar adverts from Yes Scotland, major cinema chains including Odeon, Cineworld and Vue took a collective decision to ban all referendum advertising from their venues. SNP MP Pete Wishart said: “I really do hope that the BBC pay clear attention to its own particular guidelines when it comes to this kind of production and that they are able to justify absolutely that they have not breached any of their guidelines. Asked if the film was referred to and cleared by the BBC’s editorial policy department, a Pacific Quay spokesman said BBC Scotland “knew what the production was for and editorial policy were aware of it”. He went on: “There has been no breach of editorial guidelines as BBC facilities are made available to organisations and businesses who want to use them, including political parties, on a commercial basis. BBC Scotland has been criticised for paying a Labour MSP to co-present a new programme which will debate key independence referendum issues. Senior staff at the corporation have expressed disquiet over the appointment of Kezia Dugdale, Labour’s education spokeswoman, in a paid role as a presenter of Crossfire, a Radio Scotland political show set to debut this Sunday. The arrangement contradicts a ruling from the BBC’s governing body that payments to a then Labour shadow minister at Westminster for her part in a similar programme breached guidelines. It is understood BBC Scotland was last night considering late revisions to the programme. The corporation refused to confirm or deny Ms Dugdale’s involvement in Crossfire but said it was still “formalising the format” for a show that “will be presented by a journalist” with pundits from across the political spectrum. However, Radio Times lists Ms Dugdale as one of two presenters, the other being Andrew Wilson, a managing partner at strategic communications company Charlotte Street Partners, who served as an SNP MSP until 2003. Both recorded a pilot on Sunday for the programme that is replacing the long-running Headlines. A BBC Scotland source said management have failed to adhere by their own rules by appointing Ms Dugdale, a member of Scottish Labour’s Truth Team – set up to “monitor all SNP and Yes Scotland interviews, press statements and briefing papers” – in the run-up to September. “[Kezia] is being paid. How much, I don’t know. Enough that she will have to declare it,” the source explained. The BBC’s editorial guidelines make clear it “should not normally pay MPs, or others clearly identified as representing political parties, for appearances or other contributions to any BBC output in which they are speaking as a member of their party or expressing political views”. They can, where appropriate, receive a “limited and realistic disturbance fee” along with expenses. Contrary to independence referendum guidelines, it is believed Ms Dugdale’s appointment was agreed before Alasdair MacLeod, BBC Scotland’s head of editorial standards and compliance, and Ric Bailey, chief political adviser, were informed. Despite repeated inquiries from The Scotsman asking if Ms Dugdale’s remuneration for Crossfire went beyond nominal fees, her office did not respond.